This image was composed with 3 nm H-a data mapped to red and 3 nm OIII data mapped to blue and green with RGB data blended in for star color. The increased contrast of the 3 nm H-a narrowband filter brought out the extended halos on both sides of the nebular structure in the color image. There appears to be two "loops" on the right side of the nebula. 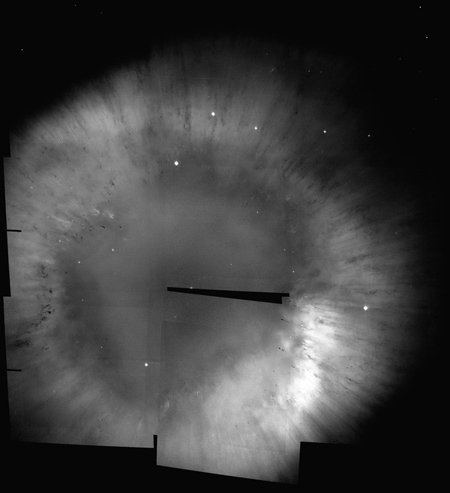 This unusual image of the large Helix Nebula takes advantage of the detail provided by the Astrodon 3 nm OIII filter, which shows numerous radial projections, as shown below. These radial spokes have surprised many, but they are clearly present in the famous Hubble Space Telescope color mosaic image of the Helix Nebula. The HST write-up states "The image shows a fine web of filamentary "bicycle-spoke" features embedded in the colorful red and blue gas ring……….". 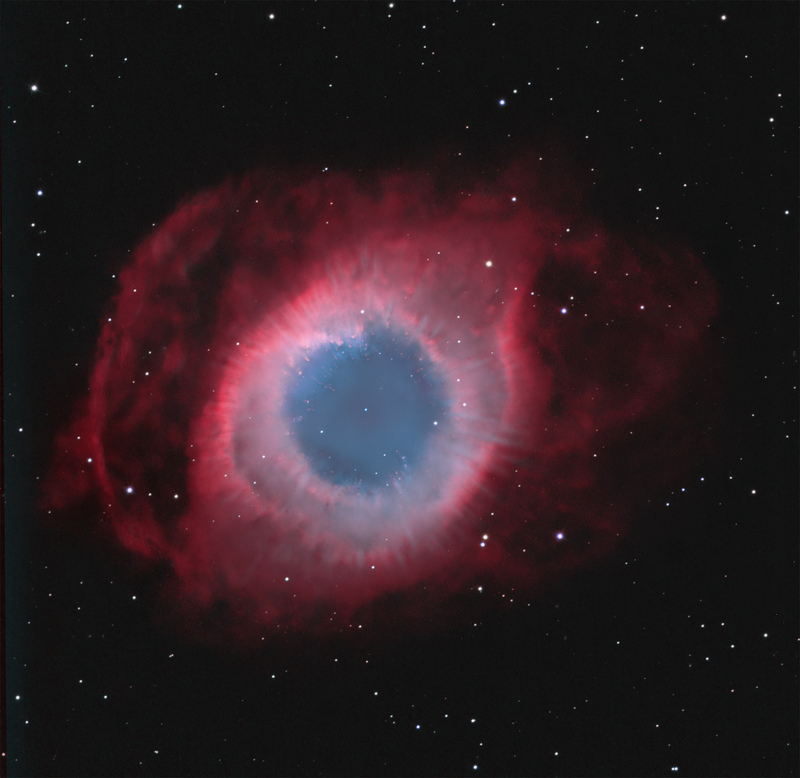 It further goes on to state with regard to visual observations "The Helix Nebula is a popular target of amateur astronomers and can be seen with binoculars as a ghostly, greenish cloud in the constellation Aquarius. Larger amateur telescopes can resolve the ring-shaped nebula, but only the largest ground-based telescopes can resolve the radial streaks." 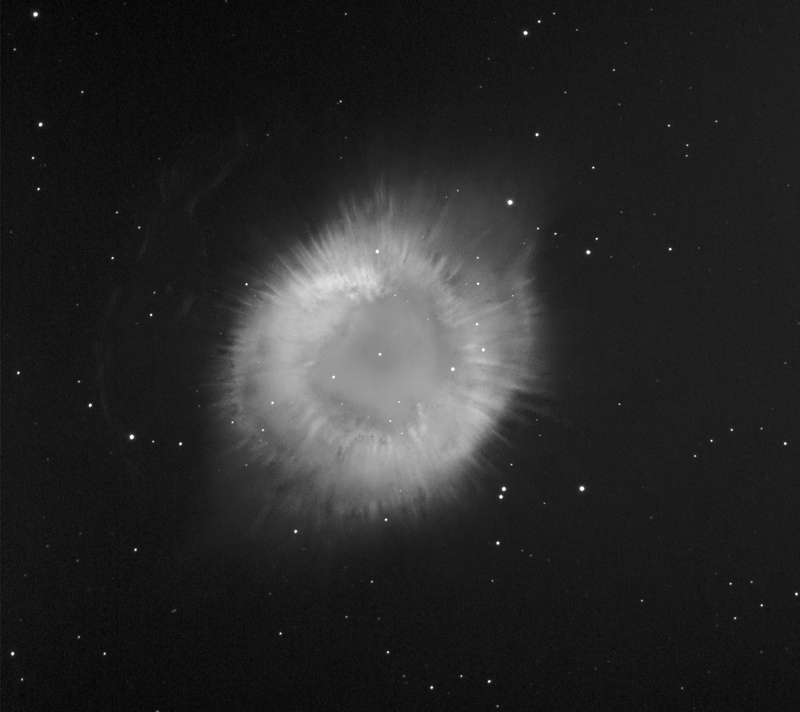 The above images show how modern CCD cameras and narrowband filters can bring out such fine details. The image below came from the OIII filter (F502N) used to make their mosaic (h_helix_502_s2cc_img.fits) in the "Cosmetically Cleaned Mosaics Section. It clearly shows the radial spokes.